We are delighted to announce that our lovely KWPN Elite mare,Harmony (Cardento x Goodtimes), is in foal to the amazing Ludger Beerbaum stallion, Cristallo 1. She has already produced 2 fabulous foals and we are very excited about the next one. Cristallo I, is an influential and popular show jumping sire who has also sired numerous highly-talented dressage horses. He is a strong, powerful horse with excellent conformation and a well-connected topline. Cristallo jumped internationally up to 1.50m level before injury forced the end of his competitive career under Sweden's Henrik von Eckermann. His sire, Cornet Obolensky competed in the 2008 Olympics at the young age of nine. He is a foundation stallion in the breeding of modern jumping horses, and is currently ranked third in the 2016 WBFSH Sire Rankings. The total earnings of his offspring, including former World Number One Cornet D'Amour, Cornado NRW, Cornet's Cristallo, Cocoshynsky, Cornetto King, and Comme Il Faut, are over €3.7 million. The Clinton/Heartbreaker cross is a proven formula that has produced multiple grand prix jumpers including Cordess and Consul DL Vie Z, and 18 licensed stallions. Cristallo's dam. Cassie, also produced Cristallo's full brother Cristallo II, who has also jumped up to 1.50m internationally, and a sister by Argentinus who has produced an international jumping mare and several promising young horses. Damsire Cassini I is a hugely influential son of Capitol I. He has produced 140 grand prix offspring, and 144 licensed sons, including Cheers Cassini, Connaught, Caressini L, Quite Cassini, and Michael Whitaker's grand prix winner and team horse Cassionato. This damline has also produced the licensed stallions Pocalino and Cornet Colbert. Cristallo's daughter Cristalline finished 10th in the 2016 World Cup Final in Gothenburg as just an eight-year-old. She has been placed in several world rankings classes, including fourth in the Wellington and seventh in the Kentucky World Cup qualifiers in 2016. His son Castello won the grand prix of Rastede, and his other top level jumping offspring include Charmeur, Cristobar, Casablanca, Camira, Cristofin, and Crystal Chloe. In addition, his daughter Cara Mia RCF competed at the World Young Horse Championships for dressage in 2016. 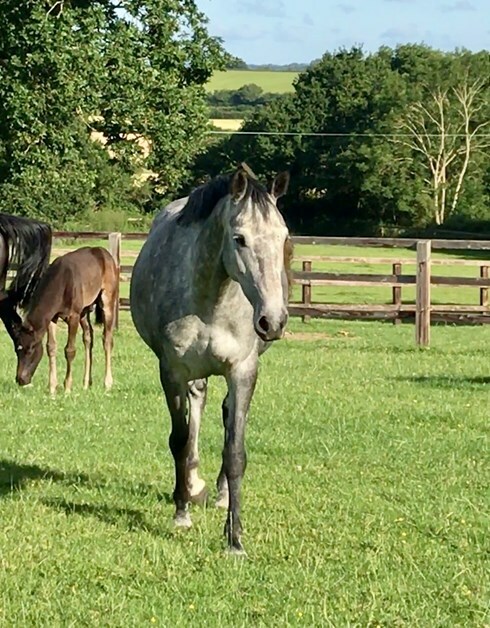 We are very proud that we are able to announce that our lovely SF mare who is graded Ster with KWPN, Alizee (Quidam du Revel x Drakar du Murier) , is in foal the world famous Casall Ask. 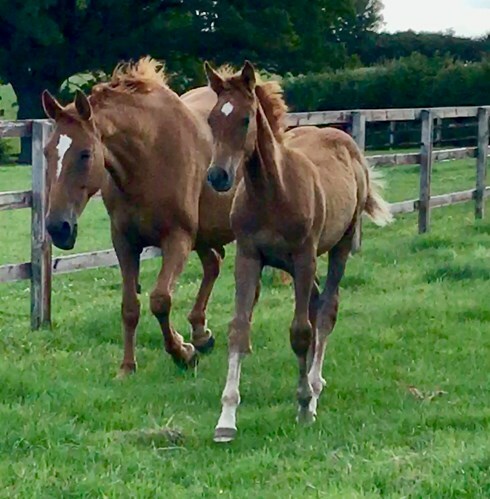 We have 2 lovely youngsters from this mare (including the one in the photo who is by Carrera VDL) . Casall Ask, as an international jumping super star with Rolf Goran Bengsston counted as one of the best sons of the deceased stallion Caretino. Casall Ask is referred to by many as the Stallion of the Century, Casall Ask competed against his own 5* progeny and on the 2014 WBFSH rankings, Casall was in 14th place, on the 2015 standings he had moved to 9th, and on the 2016 rankings, he moved into 4th, behind Diamant de Semilly, For Pleasure and Cornet Obolensky. Casall Ask had points from 52 international competitors – the most from the 2016 No 1 showjumper, Chesall Zimequest. Casall Ask has produced nine stallion sons in Holstein and also had the champion mare at the Elmshorn anniversary show in 2008. Casall's retirement was announced in 2016 after a phenomenal year and some extraordinary results. In 2016 he won Doha 2016 CSI5* 1.60m, Valkenswaard 2016 CSI5* 1.60m, Paris 2016 CSI5* 1.60m,. He was also 3rd in Antwerp 2016 CSI5* 1.60m, Monaco 2016 CSI5* 1.60m, and had many other placings within the top 10. His damline in Stamm 890 and one of the most successful Holsteiner performance mare families.